Please refer to our stock # W-JO1 when inquiring. DESCRIPTION: If you’re looking for a Native American cuff with a drop-dead “WOW” factor, this is it! This five prong sterling cuff features a fabulous, large, single turquoise stone, light blue-green in color with brown veining. The stone itself measures a whopping 2 ½” x 1 ½”. This beauty is mounted on a double row bezel with deeply stamped designs, with a pair of large silver leaves mounted on each of the side prongs to frame the design. This cuff is a real show-stopper, not only because of the large, beautiful stone, but also the heavy gauge sterling used and the expertly crafted, ornate silver mounting as well. 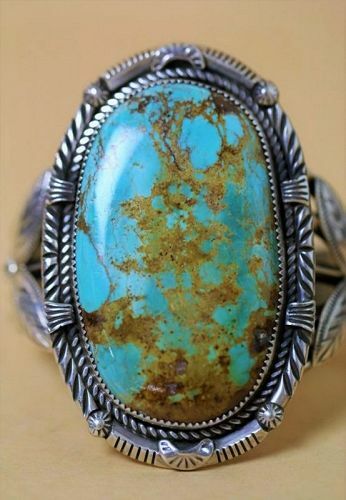 Excellent condition and signed on the back, “Sterling, HS,” designating Navajo silversmith artist Herman Smith, who uses heavy gauge silver and high-grade turquoise to create pieces in traditional Navajo Nation designs. DIMENSIONS: Center mounting is 3” high x 2” wide. Interior circumference is 6 3/8” which is Adult Medium size. Total weight is 4.2 oz or 119 grams.